The allegedly "gritty" sprites are actually close in proportion to the "cutesy" art. Yes, but when you're working in smaller resolutions like this sprites generally look better with smaller head:body proportions. If you try to match the proportions of the concept art, you'll have to remove facial features and as a result, personality. There just isn't as much room for detail in 16x32 sprites like these. But with that being said, 1:2 body proportions are a personal preference. Shane's 1:4 body proportions and side profile are very remniscent of older NES games, so I think they fit the NES aesthetic much better. And I don't think they're that gritty, either. When I think of gritty sprites I think of 1:8 sprites like in Ninja Gaiden, Contra, Metal Gear, etc. Because of my work in the horror genre, I associate that pixel shading style as "gritty". Just a term I picked up, from working in a dōjin circle. Ohh! Do tell! What did you work on? I don't know to what extent your palette budget can accommodate Mega Man-style sprite overlaps, but I edited the sprites to more closely resemble the concept art. Hey, that's a pretty neat idea! And if you play around with the shading and design a bit, you could squeeze the sprite overlays to be only 8 pixels wide. Whoa! Those are some really professional character designs! It's rare to see such artistic talent on indie projects like this. And yet...I think the pixel art designs could be a lot closer to the concept art. They're a little too serious. Maybe something like this, if it's not too late in development to change the designs? Oh, and the WIP cave tileset is also coming along nicely...I like the texture of the door and the Western effect you achieved by banding the rocks like that. The background is just starving for some detail, though...why not fill it up with some single-colored rocks? You can thank http://the-ez.deviantart.com/ for bringing out that professionalism! Basically she was shown character concept art as well as the sprites, and from there she gave them the "Wreck-it Ralph treatment." As for changing them majorly, it's unlikely since the games art style is already set in stone. Something overly cartoony could clash with the current level artwork. 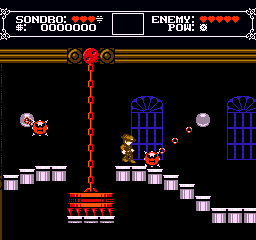 The deliberate aim is a medium between the Castlevania series and Super Mario Bros 2. The Mega Man method could always work; it does take up sprites on its respective line though right? 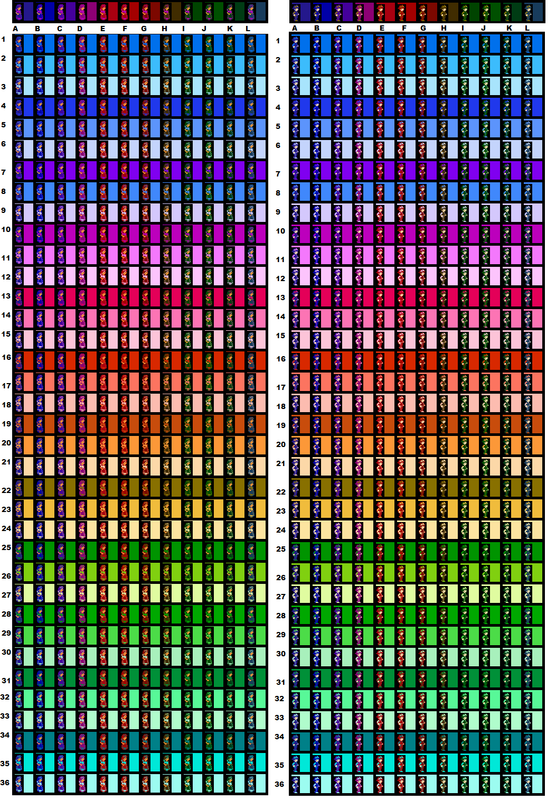 Overall, the biggest issue the black outline test came up with is the sprites look a bit odd on a black background, which good portion of stages use. You can always use different palettes for the characters depending on the level. 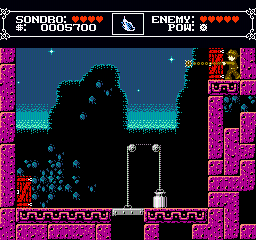 You could also try picking a darker shade of blue for those background elements, or touch up the player sprites so they're more colorful or varied. For comparison, take a look at Vice: Project Doom. Having different player palettes depending on the area you're in is also a good solution; SMB2 alternates between giving players a blue outline or a black outline depending on whether they're in a darker area or lighter area. With this tile set, you can see a slighter greater push for the western style design within the game, mainly a bordertown between Latin America and Native America. Besides that, the main thing going on right now is making sure all of the connecting levels will work under stress tests and building up more levels. Once there's enough gimmicks programmed in, I'd like to make a teaser video (right now most of the levels are just empty levels without enemies or gimmicks). I should probably remember to post here more often. I've been burned out lately from the game, but I'd like to finish it one way or another. I'd really like to commission more people to help with the sprites. Something about the players sprites still bugs me too. I like your waving floor idea. We have plenty of tech-talk, but not much talk about sharing game play ideas. Possibly because you still would need a way to program it anyway. 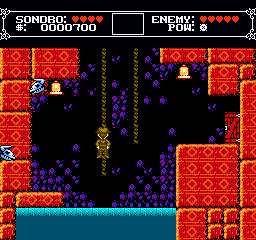 For instance, that idea would require a special type of collision detection, having to switch between sprites and tiles, and chaining objects together. I imagine the falling thing could be part of the BG, if you changed the tiles and the tilemap. The tiles themselves can be part of the tile BG. Maybe this could be special cased, and have a scroll table set out in ram. Hooking up several objects sounds too complicated for this. Timed code, with some dynamic object collision (box collision, with moving sprite objects). Not too difficult. This could *easily* work on the NES.